Getaway is a new hotel search engine, primarily for South Africa but with some listings for other African countries and for India. 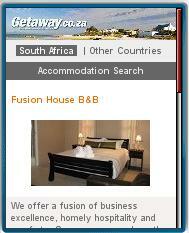 Listings include a photo, description and the hotel’s phone number and email. While the listings are useful, it might be hard to actually find or even contact the hotels as they don’t include a street address and the phone numbers and email addresses are plain text rather than click-to-call or mailto: links. This entry was posted in Hotels by Dennis Bournique. Bookmark the permalink.